Lena's background is in marine ecology working with biofouling on ship hulls. During a Marie Curie Fellowship at Plymouth Marine Laboratory in UK, Lena worked with the impact of bacterial films for development of biofouling, using the technique Fluorescence in situ Hybridization (FISH) to detect and localize different bacteria. 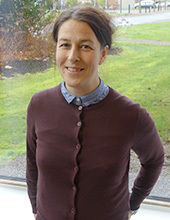 Lena also works with marine alien species introduced with ballast water and via ship hulls and is a member of the expert group Ballast Water and Other Ship Vectors in International Marine Research Council (International Council for the Exploration of the Sea ICES). There might be more projects where Lena Granhag participates, but you have to be logged in as a Chalmers employee to see them.